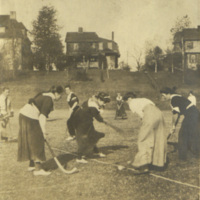 Field hockey was introduced to the United States from the UK by Constance M. K. Applebee. A graduate of the British College of Physical Education and an experienced educator and coach, Applebee attended Sargent's Summer School of Physical Education in 1901. After demonstrating the game to her fellow students, she spent the fall teaching field hockey at women's colleges up and down the East Coast, including Bryn Mawr College. The game was a huge success at Bryn Mawr. Basketball, which formerly held the most important place in outdoor sports, has now a powerful rival in hockey... 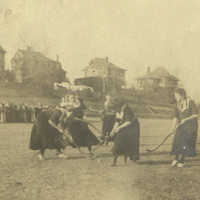 The fall of 1902 witnessed the establishment of interclass hockey games, in which no small interest was shown. Nineteen-five [the class of 1905] turned out a snappy and excellent team which won the championship. 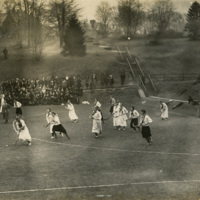 In November three match games were held on the college grounds, between the Ladies' Hockey Club of the Merion Cricket Club and the Bryn Mawr 'Varsity, two out of the three games being won by the latter. Letters and numerals were awarded for hockey, just as they have been heretofore for basketball; consequently these two sports are now on a practically equal footing1. 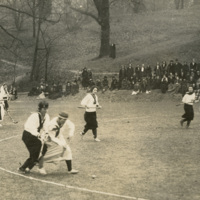 Field hockey, along with basketball, tennis, and later water polo, was one of the major sports of Bryn Mawr through the 1920s. 1. H. J. R., Class of 1903. "The Athletic Association." The Lantern, vol. 12, Jun 1903.